Editor’s note: This post has been updated to include information about Chelgren’s firearms manufacturing business and his proposal to allow students to fire professors they didn’t like. It has also been corrected to clarify that the attorney who filed incorporation paperwork for Fizzix LLC is no longer president of the lapsed law firm and supported Chelgren’s opponent in their 2010 state Senate race. Long before state Sen. Mark Chelgren caught the eye of an NBC News reporter for falsely claiming to have earned a business degree from a Sizzler steakhouse franchisee while pushing a bill to apply political litmus tests to university hires, his political aspirations were largely dismissed. Observers viewed the eccentricities of the man known then for his beer-guzzling, naked-bike-riding antics as a serious liability. But in 2010, an election year driven by anti-establishment Tea Party sentiment, Chelgren unseated state Sen. Keith Kreiman, a Bloomfield Democrat, by just 11 votes. He was re-elected in 2014 by fewer than 400. With controversy once again surrounding him, his prospects for 2018 may be even more endangered. It wasn’t the first time. Here’s a look at some of the more notable events in Chelgren’s life and career that have led up to this moment. Before he was a state lawmaker, Chelgren was best known as Chickenman, a fixture in the Register’s Annual Great Bicycle Ride Across Iowa. He was once part of the five-member Quadrabong team, named after “a four-tubed, giant beer funnel that could hold and deliver a six pack of suds to one to four players in an amazingly short amount of time,” as Janna Trevisanut, a support driver whose brother was also on the team, described it in 2002. “It was an extremely collegiate approach,” she explained. “We were small but extremely popular, as any time we would load that monstrous contraption up, people would encircle us, cheer us on, and sometimes partake, even the locals.” Eventually, the Quadrabong team split up, but Chelgren — who, Trevisanut wrote, had “gone batty with his alter ego, and drives a beer truck around the route dressed in a loincloth” (with fuzzy pink balls concealed underneath) — rode on. The beer was dispensed from the refrigerated truck he took on the route, which was modified with taps on its side and decorated with stickers bearing slogans including “I Bit the Bone with Team Dawg,” “Team BARFLY,” “BAD GIRLS WERE HERE,” “BIG EARL’S GIRLS: DES MOINES,” and “TEAM STIFF.” The kegs for the taps were provided by other RAGBRAI teams, but they weren’t always the ones who ended up drinking the beer. “Part of the deal was that Chickenman would take one of your kegs and hook it up to his own special Chickenman tap,” a Cityview reader told the alt-weekly. “That beer would go not to teams that had signed on with him but to random riders who were friendly (or cute) enough.” Chelgren’s fun was cut short, the reader added, when the Iowa State Patrol cracked down on the festivities in the mid-aughts. Chelgren’s most respectable claim to fame, perhaps, is Frog Legs Inc., the wheelchair parts manufacturing company he co-founded with fellow RAGBRAI enthusiast Dave Carr in the mid-’90s. The company’s name is a reference to its flagship product, shock-absorbing caster forks resembling the shape of a frog’s leg that can be installed on wheelchairs to reduce muscle spasms and lower back pain caused by vibrations. The idea was inspired by members of a quadriplegic rugby team the two men met during a trip to Colorado. 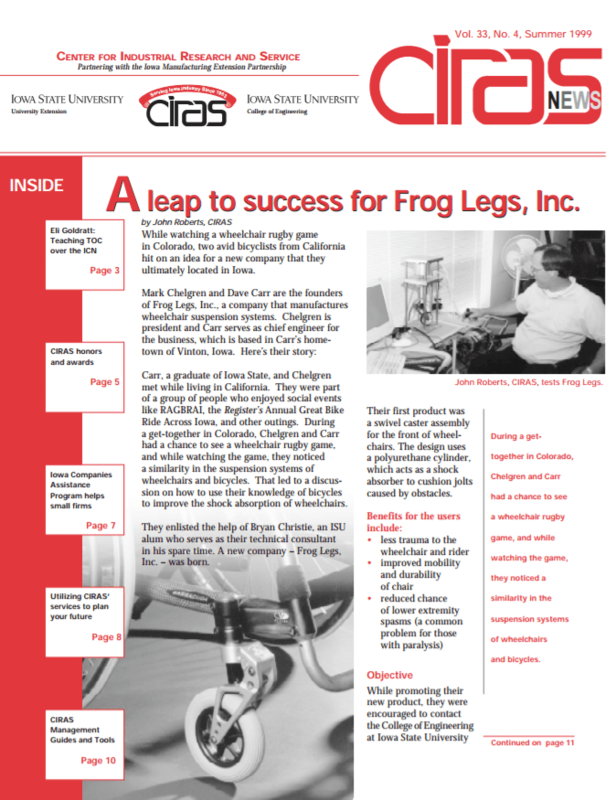 An Iowa State University newsletter from 1999 describing the university’s role in Chelgren’s Frog Legs invention. Why? Because “if someone sticks it out to drink all of that Keystone, you know they are going to the polls for you.” Rumor had it, Krusty joked, that each of the votes responsible for Chelgren’s razor-thin margin of victory were cast by people willing to stick around and kill the kegs full of the watery staple of college freshman — a feat made all the more impressive by stormy weather that diminished the turnout at the Ottumwa rally. Whatever Chelgren’s true strategy, he was drawing on past experience: As Chickenman, according to legend, he once tapped 70 kegs at a single RAGBRAI party. Chelgren may be a longtime beer-bong aficionado, but he views bong-ripping welfare recipients with less favor (despite the “420” sticker that also appeared on his beer truck and his support for rescheduling pot). Shortly after taking office, he co-sponsored a bill with 17 other Republicans, including Joni Ernst, to require anyone receiving financial aid from the state to participate in random drug testing. If they failed a test, they would become ineligible for aid until they could piss clean. The bill died in the Senate’s State Government Committee. The following year, lawmakers laughed out loud at Chelgren as he proposed an amendment to a budget bill that would have required that divorced parents receiving child support submit to drug testing as often as once every six months if their exes requested it. The amendment, which Chelgren said was inspired by a constituent who believed his ex was blowing child support money on drugs, was quickly withdrawn. Before introducing his bill to require political litmus tests for faculty hires at Iowa’s state universities, which would have prohibited new hires if they “would cause the percentage of the faculty belonging to one political party to exceed by 10 percent” over the other, Chelgren introduced legislation to establish a system to fire unpopular instructors through student voting. “A bill circulating in the Iowa State Senate offers a novel (and cutthroat) way to hold professors accountable: putting their fates into students’ hands, Survivor-style,” the Chronicle of Higher Education described Chelgren’s proposal in April 2015. Under the proposal, professors whose evaluations scored below a minimum threshold would automatically get the axe. Then, the names of the five professors with the lowest scores above that threshold would be published in an online ballot for students. The prof receiving the most votes would get the boot, too. The bill died in committee. Seeking to spread his chicken wings and fly higher after his re-election to the Statehouse the previous year, Chelgren launched an ill-fated bid for Congress in 2015 against Dave Loebsack, the sole surviving Democrat among Iowa’s congressional delegation. In one of the most egregious instances of burying the lede in Iowa newspaper history, Knoxville Journal-Express editor Steve Woodhouse waited until the final paragraph of a campaign profile with the yawn-inducing headline “Chelgren is running for Congress” to casually mention one of the lawmaker’s most extreme proposals to date: executing undocumented immigrants deported after committing felonies who were caught entering the country again. “There is no reason to have felons here who threaten our way of life,” Chelgren said. In a pander to voters (which also drew nationwide attention) before dropping his congressional bid, Chelgren introduced legislation demanding an apology from Stanford University for its poorly received 2016 Rose Bowl halftime show that mocked the University of Iowa with hick stereotypes and a FarmersOnly.com jingle. He argued that because of sanctions the marching band was under, the university erred in allowing it to perform at the Rose Bowl in the first place. The bill stipulated that until Stanford apologized to both the University of Iowa and all Iowa citizens, future “collaboration or cooperation” between Stanford and Iowa’s three regents universities — excluding sporting events — would be prohibited. Like many of Chelgren’s other proposals, the bill was widely mocked and went nowhere.